Retirement Relocation: Where are Boomers heading for retirement? Do you subscribe to Where to Retire Magazine? I find their articles, backed by thorough research, to be some of the best out there. AARP also publishes some great data, but I find that Where to Retire has a good grasp on what younger retirees are looking for and thinking about. 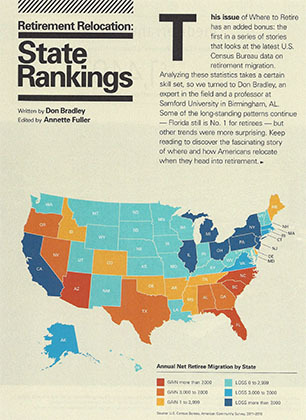 The current issue has several interesting articles but the one that really caught my eye is the Retirement Relocation: State Rankings. This article written by Don Bradley even went back and compared 2006 – 2010 to the more recent period from 2011 – 2015. 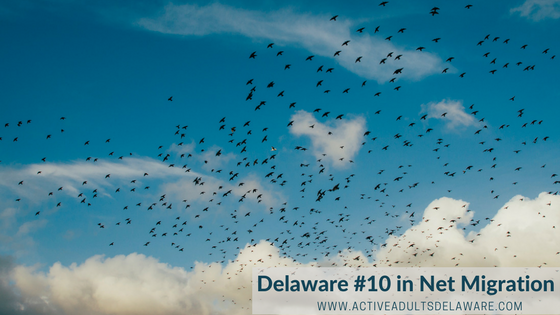 Delaware Ranks #10 with a net gain of 2,448 persons age 60 and older annually between 2011 and 2015. Now that might not sound like a lot, but when you consider how small Delaware is, placing number #10 is a big deal. What are the others in the Top 10? Florida of course ranks #1 with a net-migration of 57,392, but that means that 118,982 moved into Florida while 61,590 moved out. Some of those that moved out probably came here to Delaware to be closer to the families they left behind in the Northeast. By the time you get to #18 ranked Utah, you are already in Net-Migration negative numbers. Arizona ranked #2, followed by South Carolina, North Carolina, Nevada, Georgia, Texas, Alabama and Oregon. “In the Northeast, only Maine and Delaware attracted more retiree-age people than moved out of the state.” Then Don Bradley continued “Past studies using the 2000 census data also found positive net migration to these two states, suggesting the pull of these states is well-established.” Given that I relocated to Delaware in 2000, became a REALTOR, a Seniors Real Estate Specialist and eventually a Broker specializing in Active Adults relocating to Delaware, I have observed this trend first-hand. Continue down the list of State Rankings and you will note that the bottom 10 states include New York (#51), New Jersey (#49), Pennsylvania (#48), and Connecticut (#43). A huge percentage of our relocating Buyer clients are coming from those 4 states with more coming from Virginia (#41) and Maryland (#40). Obviously many people leaving these states are moving to the top few, especially Florida, South Carolina and North Carolina, but a good percentage of them are moving to Delaware for very good reasons. America’s 100 Best Places to Retire, Fifth Edition, rates Coastal Delaware as one of the top retirement areas. “With beaches, boardwalks and low taxes, Sussex County small towns provide easy lifestyle near big cities,” begins Candyce H. Stapen. If you are an Active Adult interested in migrating to Delaware for your retirement, please contact the Active Adults Realty team today! Or CLICK HERE to download our FREE Relocation Package to help you the right home in Northern, Central or Southern Delaware.